Solyndra, Inc. was supposed to have showcased the effectiveness of the Obama administration’s stimulus and green jobs initiatives, but instead it has become the center of congressional attention for waste, fraud and abuse of such programs. According to a Feb. 17 letter signed by Energy and Commerce Committee Chairman Fred Upton, Michigan Republican, and Oversight Subcommittee Chairman Cliff Stearns, Florida Republican, to Energy Secretary Steven Chu, the Fremont, Calif.-based solar panel manufacturer squandered 5 million of stimulus money. The company became the first recipient of an Energy Department loan guarantee under the stimulus in March 2009, which was intended to “finance construction of the first phase of the company’s new manufacturing facility” for photovoltaic solar panels. The Energy Department estimated in a March 20, 2009 press release that the loan guarantee would create 3,000 construction jobs and a further 1,000 jobs after the plant opened. And President Barack Obama and Vice President Joseph Biden each personally showcased Solyndra as an example of how stimulus dollars were at work creating jobs, during appearances at the company over the course of the following year. Biden personally announced the closure of Solyndra’s 5 million loan guarantee in a Sept. 9, 2009 speech, delivered via closed-circuit television, on the occasion of the groundbreaking of the plant. “These jobs are the jobs that are going to define the 21st century that will allow America to compete and to lead like we did in the 20th century,” Biden said. According to Biden’s speech, the 5 million loan guarantee was a smaller part of the billion of stimulus money the administration planned to spend as part of its Green Jobs Initiative. Obama made similar claims in a May 26, 2010 speech at the plant, but the 1,000 jobs he and Biden touted in their respective speeches failed to materialize. Instead, Solyndra announced on Nov. 3 it planned to postpone expanding the plant, which cost the taxpayers 0.5 million, or 73 percent of the total loan guarantee, according to the Wall Street Journal. It also announced that it no longer planned to hire the 1,000 workers that Obama and Biden had touted in their speeches and that it planned to close one of its older factories and planned to lay-off 135 temporary or contract workers and 40 full-time employees. A closer look at the company shows it has never turned a profit since it was founded in 2005, according to its Securities and Exchange Commission (SEC) filings. And Solyndra’s auditor declared that “the company has suffered recurring losses, negative cash flows since inception and has a net stockholders’ deficit that, among other factors, [that] raise substantial doubt about its ability to continue as a growing concern” in a March 2010 amendment to its SEC registration statement. “While we understand the purpose of the Loan Guarantee Program is to help private companies engaging in clean energy products to obtain financing by providing loan guarantees, subsequent events raise questions about Solyndra was the right candidate to receive a loan guarantee in excess of half a billion dollars,” Upton and Stearns wrote. A June 2010 Wall Street Journal report indicating that Solyndra’s majority owner, Oklahoma billionaire George Kaiser, was a major fundraiser for the 2008 Obama-Biden campaign has stimulus opponents such as Citizens Against Government Waste crying foul. Kaiser flatly denied he had anything to do with the loan guarantee when he was asked by the Journal, but Page nonetheless sees cronyism in the loan guarantee because personal involvement of the president and vice president in the project. “This seems like a quid pro quo, and it raises a lot of questions,” Page said. Other stimulus critics say Solyndra shows just how flawed the program has been from the beginning and how it has failed to create jobs and needs further oversight. Solyndra is just the tip of the iceberg, according to Cortes, who plans to raise awareness of other stimulus pork projects such as an approximately 0,000 television ad campaign in New York aimed at promoting healthy eating habits. “While that’s all well and good … it doesn’t do anything to create jobs,” Cortes said. And Mattie Corrao, government affairs manager with Americans for Tax Reform, said the Solyndra loan shows how hollow Obama’s promise to keep close track over how stimulus money has been spent has been. Vess Soda is a brand of soft drink manufactured and distributed primarily in the St. Louis, Missouri, metropolitan area. The company was founded in 1916. 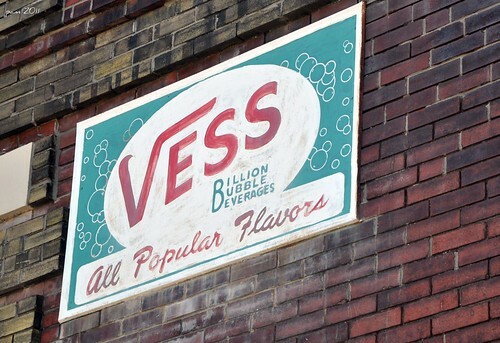 During the height of its popularity, Vess had bottling plants in several locations including Asheville, Lafayette, Anderson and Cincinnati. It is now owned by Cott Beverages. As of 2007 Vess soda is sold in small plastic bottles and cans, as well as 2 and 3-liter bottles. Its slogan is "The Billion Bubble Beverage". Vess flavors include the standard cola and fruit flavors. Vess is well-known for their orange soft drink, Whistle. The cream variety is an unusual deep pink color. Vess-Up is their lemon lime soda. Vess also produces cherry cola, black cherry, pineapple, peach, piña colada, strawberry, grape, blue raspberry and kiwi-strawberry flavors. There are also Vess tonic water, ginger ale, club soda and seltzer in one liter bottles and standard and fruit flavors available in 2 and 3 liter variety. Some of their varieties such as root beer and peach have artificial sweetener in both the regular and diet versions, which is not typical in the American soda market. Thanksgiving Day is typically celebrated by gorging ourselves with yummy turkey and stuffing, and of course counting our blessings. But before the bird hits the table, there’s much to be done to ensure not only a juicy meal, but also one free of harmful bugs. Have a query regarding health insurance or mediclaim policy? Maybe we can help. Drop us a line and our expert, Harsh Roongta, CEO of Apnapaisa.com, will answer it.